No matter what your collaboration needs are, the CONTEX Summit will meet them. 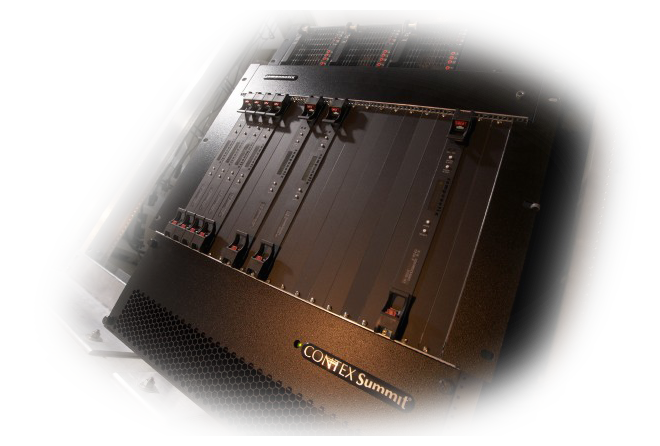 With a small footprint, unlimited capacity, and rich features, the CONTEX Summit provides carrier-class reliability. The CONTEX Summit allows participants to “meet” at anytime, from anywhere in the world over the telephone or Internet, with or without reservations. The industry’s first Concentrated Media Processor (CMP) — is a new class of conferencing hardware. This new platform combines the quality and reliability of traditional conference hardware with the scalability and flexibility of a media server to bridge the transition from circuitswitched to packet-based telecom networks. All Compunetix systems feature open-system APIs that allow customers and third-party developers to design and fully integrate extended applications for faster service creation. The CONTEX Summit’s open development environment makes it the center of our clients’ collaborative audio services. If you want a high-capacity, expandable, reliable, and feature-rich audioconferencing platform, the CONTEX Summit is the system for you! Want More Information on the Summit?